I have enjoyed adding a few memorable decorations bit by bit to my son’s nursery. 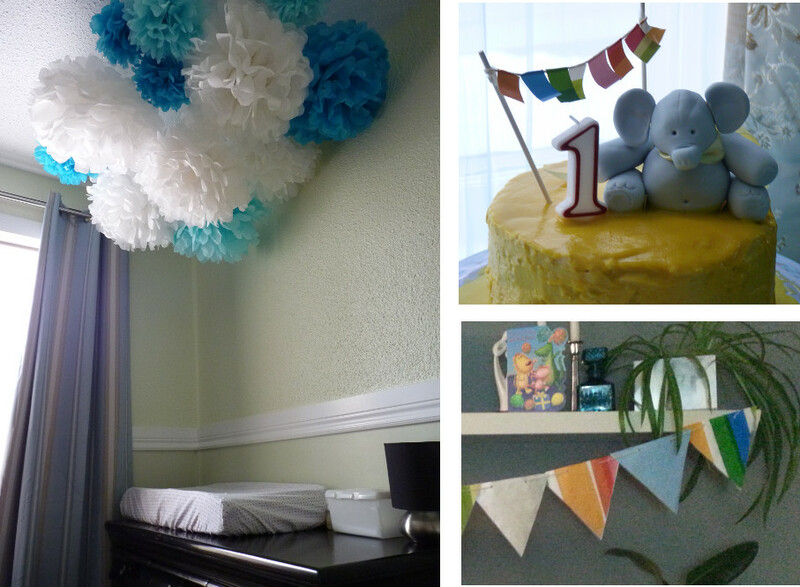 Over his dresser/ change table, I hung the white and blue pom-poms that I made for the party after his baptism. In his room, I also hung bunting that I made for his first birthday. All the little things that I have enjoyed making for him through-out the year, rather than finishing everything before he even arrived. For me, it has given a reminder of family and friends…special mementos, as it were. When we first received the news that we were expecting our little one, I was so relieved that we had already put the sweat equity into renovating a room that was to be our home office. It just so happened that this room was adjacent to our own room and the colours we chose were soft yellow-greens (a calming yet creative atmosphere). We originally chose the colours by analysing the Feng-Shui of the house but it also was the perfect gender-neutral colour scheme. Please note that I did NOT hang any decorations over his crib, even though I wanted it there originally, I just couldn’t give into chance that if one of them fell and the strings accidentally choked him….I would just never forgive myself. I would implore that you also do not hang things over a baby’s crib for that same reason. 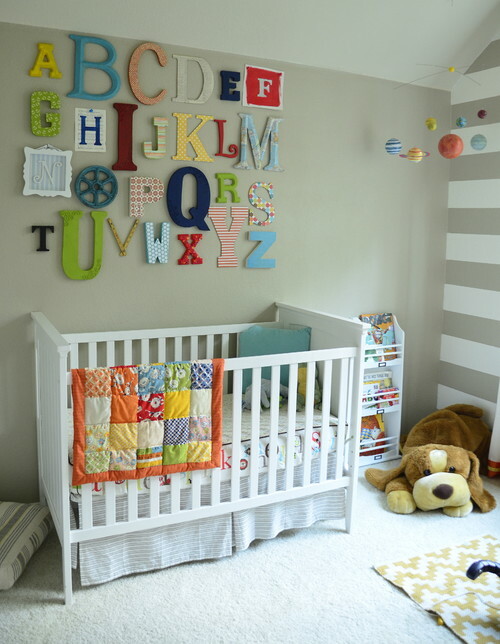 The art of a nursery is designing for the momentum of growth rather than perpetuating infancy. At five years old your child shall know what he or she likes but until then its a guessing game. The task as a parent is to create an environment that will encourage the mental and emotional growth of our children. No matter what you chose…material, layout, whatever, as long as your baby has a loving environment you are in the right direction for a happy child. No matter what, have fun with it. I found some great examples that I hope you will enjoy. I love the alphabet mural on the wall. It is colourful and playful. You could let your creativity lose on this. The warm grey is clean and contemporary especially with the adjacent striped wall. This is a bit more on the romantic side, but I do like the mis-matched fabric of the furniture, to keep it from being too bland, The whole scheme is within the same colour palette but it is the arrangement of textures that gives this room its appeal. The little canopy is nice to look at, but just keep in mind that once they are able to reach it, it shall be pulled and tugged. Do not make it too long that they can wrap themselves up. It may be best to remove it once they are about 6 months old and reintroduce it for their single bed at pre-school age. Honestly, this feels like a breath of fresh air. The white room with light playful prints and mural all are within the same theme and opens the space. It is still a bit more on the grown-up side, but as the little one grows it will soon gain his or her personality. Regal duchess! but oh so achievable. (warning reminder on the drapery!) Even without the sheer embellishment this room is in a class of its own. A neutral background with soft pink accents on the ceiling, picture frames and rug gives the room depth and a feel of luxury. 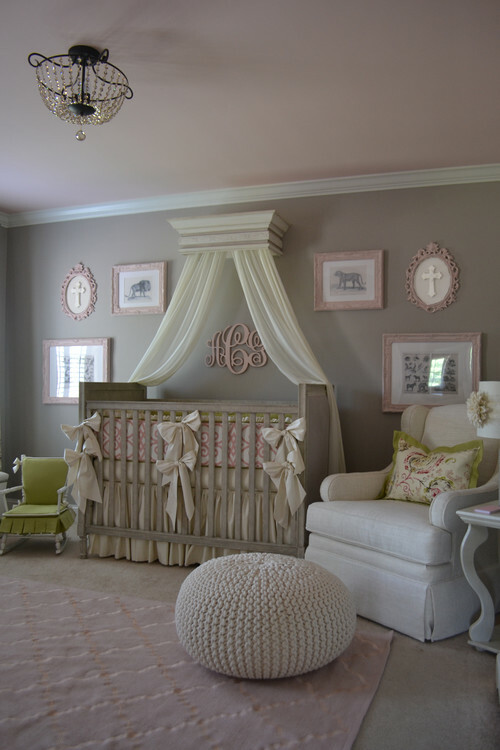 A fun and playful nursery. This lovely colour co-ordinated scheme is trend-setting and contemporary. You could get the same look by picking a dominating patterned fabric, in this room it is the grey chevron fabric, along with a supplementary plain solid colour, a warm yellow in this scheme. It feels fresh, light and simple! Categories: Bedroom | Tags: alphabet mural, baby room, contemporary, creative, crib, Do it yourself, Nursery, playful, romantic, Scandinavian | Permalink.